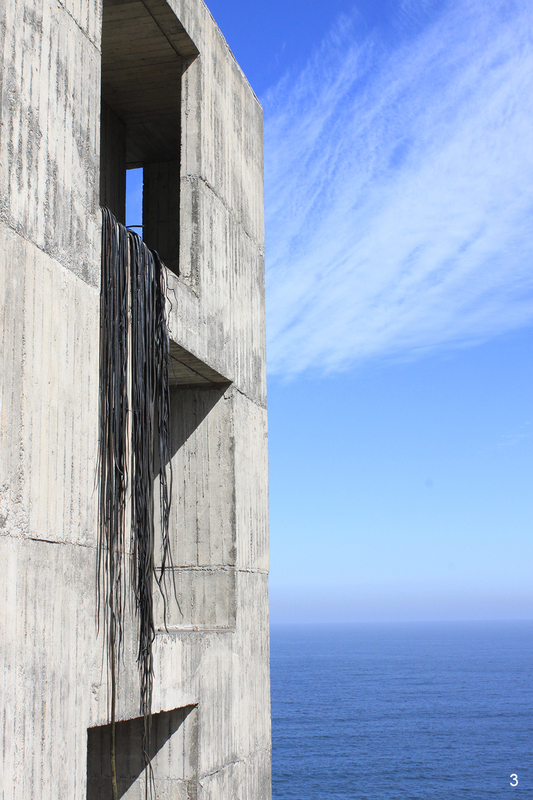 Situated in a spectacular cliff overlooking the Pacific Ocean, CASAPOLI is a private, not-for-profit, cultural center founded by Eduardo Meissner, Rosmarie Prim, Sofia von Ellrichshausen and Mauricio Pezo. The center was founded in 2003 with the purpose of stimulating critical thought and experimental art in the Bío-Bío región of Chile. 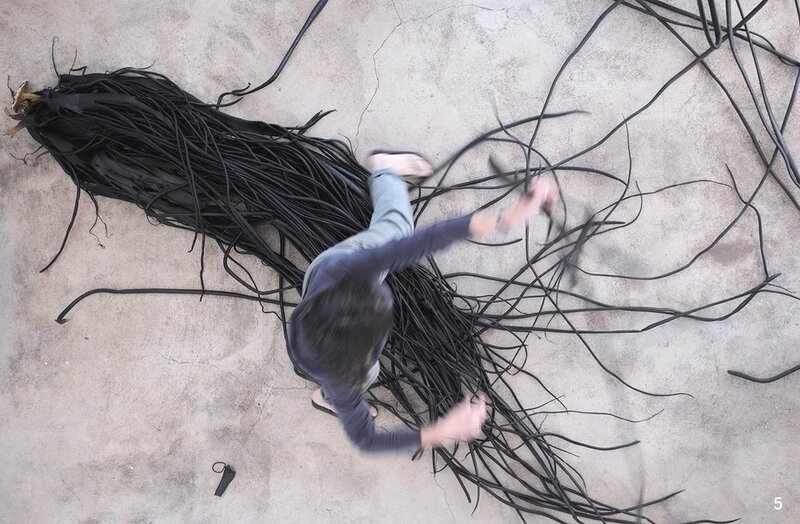 Artists Leslie Fernández and Oscar Concha are the directors of the residency program which hosts international artists, who live and work at CASAPOLI. Fernández and Concha have initiated other projects of note such as Balcón Project and Proyecto Móvil. The following index corresponds to images from the photography book "Club Disminución", printed as part of the exhibition by the same name at The Soap Factory, 2014. The fictional Club Disminución parodies resort and international travel packages targeting the leisure class. The black chairs face sunset, some of them toppled by the gusting winds that perpetually batter Casa Poli. In the early 16th century a remark by Fray Francisco de Ugalde to Charles I of Spain led to the phrase, “el imperio en el que nunca se pone el sol” (“the empire on which the sun never sets”), which has since been used to refer to America’s singular reach and status as a superpower. The phrase assumes a degree of irony in the age of global warming, as the earth’s atmosphere is increasingly seen as subject to the industrial activity on which geo-political power and influence rely. 2 Cochayuyo (Durvillaea Antartica) can be found washed up on beaches after storms. 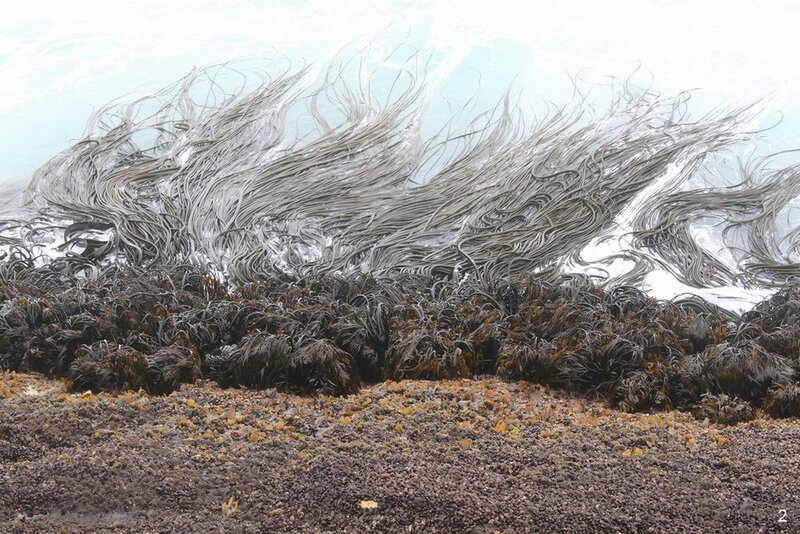 This giant kelp, found only in New Zealand and Chile, has a honeycomb structure that gives it strength and buoyancy. It can withstand powerful water currents, equivalent to 1100 km/h wind currents on land. Cochayuyo is used in Chilean cuisine to make salads and stews, and is exported to Asia and other parts of the world for consumption. 3 The architects Mauricio Pezo and Sofia Von Ellrichshausen conceived of Casa Poli as one cube inside another cube. The space in between the cubes is used for stairs, storage, bathrooms, and ample window sills that function as verandas. Working in Casa Poli is like having a studio inside a Sol Lewitt sculpture. 4 Casa Poli was built out of poured cement. The same boards that where used to pour the cement are used for the cladding inside, revealing the negative and positive impression of the wood grain throughout the structure, and embodying the minimalist spirit of the project. 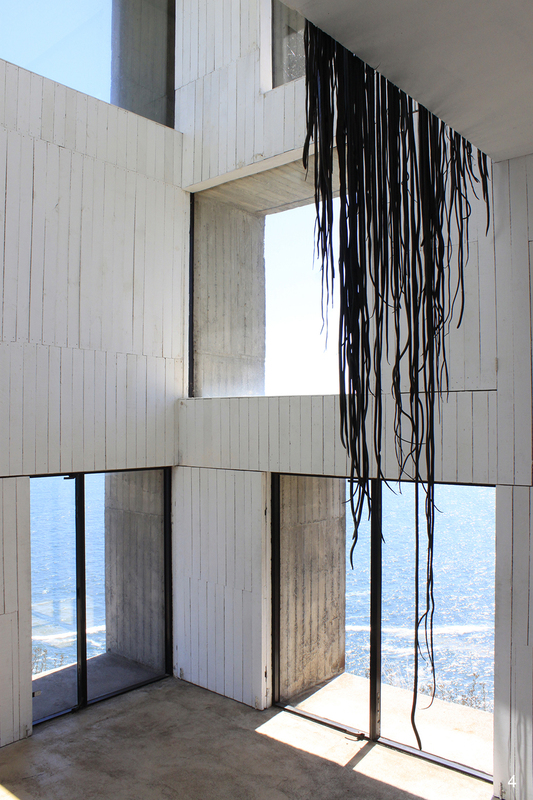 Cochayuyo hangs from one of the windows inside the building, its tendrils contrasting with the white, rectilinear lines of Casa Poli. 5 Photograph by Oscar Concha of Alexa Horochowski, working with cochayuyo inside Casa Poli. 6 This soccer ball found abandoned in Playa Blanca recalls Buckminster Fuller’s geodesic domes, but its deflated condition points to a dystopic future very different from the one he envisioned. 7 A Magellan penguin, washed ashore. 8 A sand bag resembles a pillow, both because of its shape and color, and because of the feathers sticking out of it. Pine needles arranged themselves into a small canopy. 9 A broken kite, repurposed by nature as a weathervane. 10 Stray dogs are so common in Chile that the slang term quiltros evolved to describe their presence. Five stray dogs live seasonally at Casa Poli, Perro Grande (Large Dog), Coliuma, Melinca, Tímido (Timid), and Laucha (Mouse). Leslie Fernandez and Oscar Concha, who direct the artist residency out of Casa Poli, maintain dogs when they are on site, feeding them, having them spade/neutered, and treating them for illnesses. During the winter months their visits are less frequent and the dogs survive on rodents and scraps from area residents.